While preaching in Sweden, evangelist Chris Overstreet said he stood in front of thousands of people and pictured stadium events springing forth throughout America, and the first location he saw was Portland. This month is when he believes those expectations become reality. 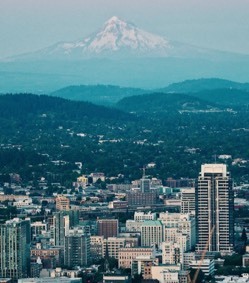 Overstreet—who recently moved from Redding, California, to Camas, Washington, because of the calling he senses to reach the Northwest for Christ—is leading a long-planned, two-pronged coordinated effort called Compassion to Action in Portland from Sept. 17 through Sept. 22. Seventy local churches are partnering in the project, which has been preceded by prayer and fasting and numerous informational gatherings. From 10 a.m. to 10 p.m. both days, the Compassion to Action team will be in the square, waiting to direct all who come to strategic locations in the city that would work best for sharing the Gospel. Other teams of intercessors will do prayer walks, and musicians are invited to bring instruments and participate in traveling worship teams. The activity then switches to the Oregon Convention Center for the next four days—Wednesday through Saturday, Sept. 19-22—with Compassion to Action events featuring not only Overstreet but also internationally known speakers Marilyn Hickey, Todd White, Bill Johnson, Robby Dawkins, Daniel Kolenda, Ben Fitzgerald, Richie Seltzer, Mattie Montgomery, Reinhard Bonnke and Lisa Bevere. Music will be by Lindy Conant & The Circuit Riders, Jake Hamilton, and a team from Bethel Church in Redding, where Overstreet has served as an outreach pastor. The meetings will be televised globally by God TV. Seating capacity at the convention center is 10,500. As of several weeks ago, 3,200 $15 admission tickets already had been reserved, with attenders coming from 18 states and 12 different nations. But event organizers are hoping that ultimately many of those attending at the convention center will be people whose lives were freshly touched on the streets by Flood Portland and who are eager to be discipled. Overstreet sees the Portland events as a potential catalyst for national revival. “I believe the stage has been set for America, that America shall be saved,” he said at a promotional meeting Aug. 3 at First Baptist Church of Portland. Overstreet said the vision for the Portland effort came to him while he was involved in a 2016 evangelistic rally in Sweden. He said he stood in front of thousands of people and pictured stadium events springing forth throughout America, and the first location he saw was Portland. Overstreet also noted the large stadium outreaches held in the region this summer by Andrew Palau, Franklin Graham and Jose Zayas.